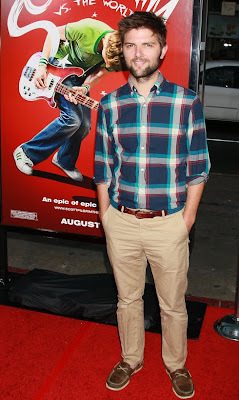 Adam Scott @ Hollywood @ the premiere of Scott Pilgrim vs the World. Look seems pretty stylish.Completely must have items. Please look carefully to the belt, turquoise, my fave. color and brown mixed. Both in harmony with the shirt and the pannths ? How about the shoes. Sure, I won't go a premier in this outfit, but he looks amazing.